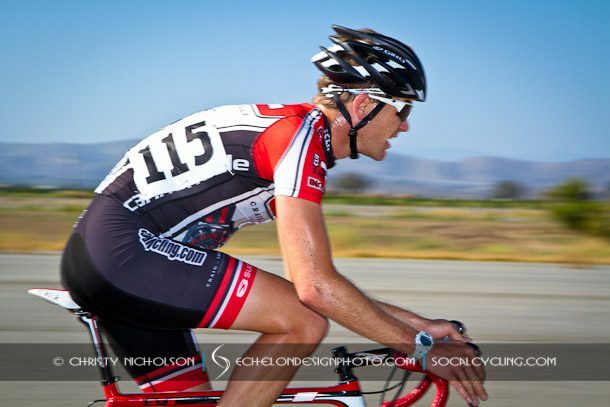 This weekend at the Orange County Cycling Classic Omnium the SoCalCycling.com Team came out in top form. On Day 1, after a couple hard laps on the 2.7 mile course and the usual chaos of counterattack after counterattack a break was soon established. I found myself and trusty beast of a teammate Lucas Binder in a selection of riders with two KHS riders and Shawn Wayland of Serious Cycling. There was an apparent dissatisfaction with the mix of that group of seven, so it was soon reshuffled after a couple laps and a final compact break of three was made. Fortunately, Lucas Binder (SoCalCycling.com) was able to find himself in this move which left myself and the rest of the SoCalCycling.com Team to make trouble for the chase effort by disrupting the pace. The break of three got up to 30 seconds when with two laps to go, it was pulled down to a mere 15 seconds with SDBC and Wayland making strong efforts to pull it back. Fortunately, our treacherous “strategy” in slowing them up was enough to keep Lucas off the front earning him a 3rd place in the GC going into day 2. Ryan Schneider in his first race back after breaking the all too popular collarbone at Dana Point gave a fantastic leadout to slingshot me off the front to take the field sprint. After a nice recovery dinner and some friendly banter I hit the sack in preparation for the next days challenge. Day 2 at the Orange County Cycling Classic brought forth an obstacle bound to make any roadie quiver with fear and send the social media debates concerning tire width into full swing. A 1000 meter dirt section sat before us as a SoCal rendition of Europe’s famed cobblestones. The next 8 laps of 4 mile glory was sure to get cattywompus. Having done my fair share of exploring fire roads off the main paved climbs, I was confident to get a little dust on the faithful Cannondale EVO and try out the ever stable platform of ROL wheels. As a seasoned Xterra Triathlete and 6 and 12 hour mountain bike competitor, I was taken by surprise as to how deep the sand was in some of the dirt sections. At 25mph the sand was just deep enough so that your chances of making it though safely were at 50/50, same as the USA making it into the round of 16 at the World Cup. On the first lap there was a land mine of bottles being ejected and several riders down with parts strewn about. Total chaos for a normally composed and seasoned pro field. The cat and mouse game of sorts became chess at 180 beats per minute as individual riders tested the GC contenders as they shot off the front. The race started with some 30-40 riders and quickly dropped rider after rider as wheels failed, seat posts cracked, and tires exploded. It is days like today that I am elated to have the peace of mind to be on Continental Grand Prix 4000 tires. These things when aired up to 120 psi have yet to allow me a flat tire even while riding single track that should be relegated only to a knobby tired machine. I understand y’all like to be cozy and run the tires low at 80psi for the bumpy stuff but 120 works for me. If it ain’t broken I’m not about to fix it. So we’re alive and rolling. Tyler Locke, David Robertson and Tim Woo of SoCalCycling.com are keeping it regulated making sure the big threats are neutralized. Perfect, because this leaves Lucas Binder and I fresh to defend our GC rankings. 8 miles to go, Lucas and I find ourselves in a three man selection with a SPY rider chasing down a late game break from Incycle and friends. I burn all my matches and whip out a final single use lighter and get Lucas as far up the road as I can before exploding into the land of Myocardial Infarction. Lucas holds on for 5th for the day which secures his 3rd overall in the General Classification. After a hard fought weekend I walk away satisfied to see the boys work together seamlessly to sacrifice for each other. It’s a beautiful thing racing bikes though the gracious support of our sponsors and putting in the hurt while mashing pedals through the dirt. Thank you to all of our sponsors – SoCalCycling.com – Your Cycling Source, Cannondale Bicycles, Sugoi Performance Apparel, FULL SPEED AHEAD, Pacific Premier Bank, ROL Wheels, Clif Bar, fi’zi:k, Echelon Design,Caravan Global, Incycle Bicycles, Continental Tire, ASEA, TRP Brakes, Larsen’s Restaurants, Levi Locke, Michael Klinkenberg, Craig Shelly.